Inverness returned to the play-off places thanks to their 3-2 victory over Ayr United on Tuesday, with the result leaving them nine points adrift of leaders Ross County with 14 matches still to play. Robertson feels a victory over Gary Caldwell’s second bottom Jags side at Caledonian Stadium today would signal his side’s intentions to mount a late challenge for the title, and he said: “We have said all along, we look at the team directly above us and try to catch them. “We are now looking at Dundee United and that’s all. 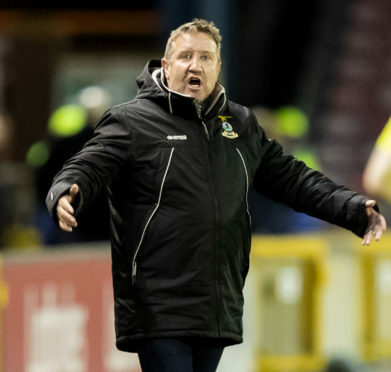 We’ve got to get results – and there is no point in going to Ayr and winning if we are not going to follow it up with a victory at home to Partick Thistle. “Every game is tough, we know every team in this league can beat each other. We just have to be focused and ready for Partick arriving here. “Our form has been great, in the last six or seven games we have played some really good football and been the better side in every game, even though we have not won them all. “Things are coming together nicely and if we finish this week with another win we will be right back in the fight. Inverness sold English attacker George Oakley to Premiership side Hamilton Accies on transfer deadline day, however Robertson does not believe he is lacking in attacking threat, with Nathan Austin having netted a double in the midweek victory over Ayr. Robertson added: “Nathan is a finisher, he scores goals. In his general all round play and his touch he has not been at his best, and he has been plagued by injuries all year. “Aaron Doran and Tom Walsh had been firing on all cylinders before their injuries, while Jordan White has been scoring goals.